Boutique (from my mac dictionary): French, literally ‘small shop,’ via Latin from Greek apothēkē ‘storehouse.’ Compare with bodega . "People go out of their way to purchase certain goods - like moleskine notebooks - or buy cheese from specific vendors because it broadcasts something about who they are. This statement can be personal/internal, shared with a small audience..."
[Consequently, Sanford runs these boutique-like events called Stirr in the Valley that people really connect to] Oops...wrong Sanford! David Sanford, who wrote this actually works at LinkedIN. It's a way to connect. To friends. To the environment. To your heritage. To your neighbors. To your senses...etc. And, it is a way to express yourself. We've understood that we have purchasing power. That if we use that purchasing power towards our passions and beliefs (sweat shop free, recycled materials, locally grown free from chemicals, etc.) or as ways to tell others who we are, we feel like we have a bit more control over this mad, mad consumption culture we live in.....or something like that. I don't know...I'm really still exploring this. Trying to figure it out. Not 'nail it down' or anything (you know how I hate defining things narrowly), but definitely trying to differentiate it from what is already out there. :: Total bonus. 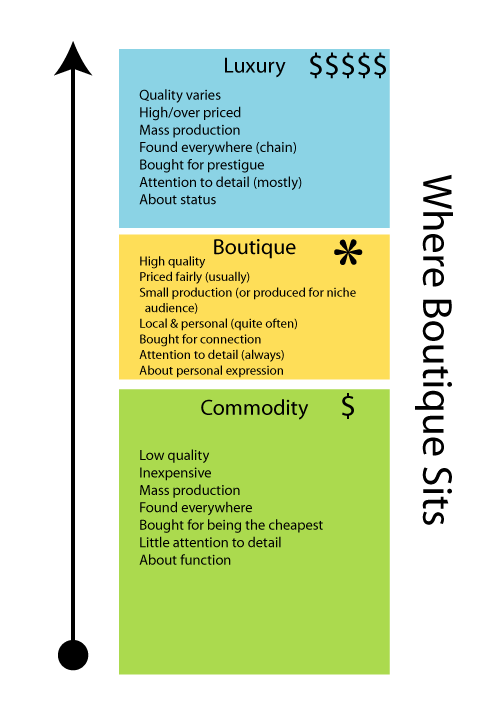 David Sanford created this interpretation of What Boutique is [pdf]?